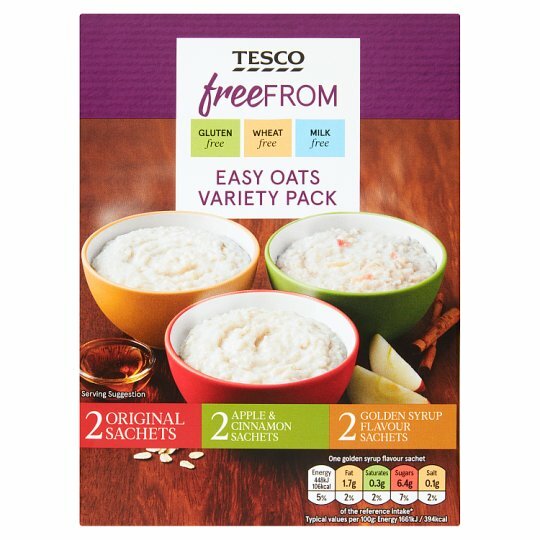 6 Gluten free microwaveable porridge oats variety pack 2 original, 2 golden syrup flavour, 2 apple and cinnamon. 2 Original, 2 Golden Syrup Flavour and 2 Apple & Cinnamon. INGREDIENTS: 2 Original Porridge Oat Sachets (Gluten Free Oat Flakes), 2 Golden Syrup Flavour Porridge Oat Sachets (Gluten Free Oat Flakes, Sugar, Flavouring, Salt), 2 Apple And Cinammon Porridge Oat Sachets (Gluten Free Oat Flakes, Sugar, Dried Apple, Ground Cinnamon, Salt). Instructions: Pour contents of sachet into a microwavable bowl. Fill the empty sachet to the fill line with milk, water or dairy free alternative (approximately 140ml), and pour into the oats and stir. Microwave on full power for 2mins 15 secs – 2mins 55 secs (800W), 2mins – 2mins 30 secs (900W), until the desired thickness is achieved. Instructions: Empty contents of one sachet into a saucepan. Simmer for around 2 minutes, stirring occasionally until the liquid is absorbed and the desired thickness is achieved. Gluten free microwavable golden syrup flavour oat porridge. INGREDIENTS: Gluten Free Oat Flakes (79%), Sugar, Flavouring, Salt. Gluten Free Oat Flakes (72%), Sugar, Dried Apple (4%), Ground Cinnamon, Salt. For allergens, see ingredients listed in bold on the outer carton.